Today's question: Where does the magic happen? Tell us about the studio, room, corner, desk, table, floor, or wall where you make art and show us one photograph which somehow captures your creative space or a work in progress. The following is the first of four posts to answer this question. Suzan Buckner I converted my daughter's bedroom into my 'studio'. I clean it weekly, and yet it is always a mess, I throw a lot of things around, push them onto the floor, and generally don't worry about it. I can't ever find anything, and end up tearing the room apart looking for one tiny thing, or picture. Traci Huskamp Funny you should ask this particular question. I have been going through a BIG studio makeover. This studio redo is something that has been brewing in my mind, and occupying my thoughts since the early spring. This desire to clean-up, clear-out, and spruce-up had finally reached a fever pitch after reading some of the posts by my friend. 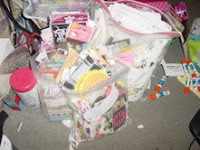 She has also been slowly sorting, discarding, and passing along supplies and miscellaneous items she is no longer using. Throughout her experience, I have found her words to be very enlightening. She writes that letting go was easier than she expected because of a now better understanding of her own artist soul and creative process. She felt the need to give up those things, whatever they may be, that did not contribute to her artmaking. This can be a difficult task because so many times, we as artists, are venturing out to test new waters, new ideas, new techniques, and they all require stuff. Tricky... how do you balance between diving into a whole new realm of art or not, or when to let go of a collection of supplies that have been left untouched for years, wondering and worrying that you will regret the decision or feel guilty about being wasteful. All of this started me thinking as I looked around my own studio. When I first moved into this space over three years ago, I had an adequate amount of room. Honestly, I was just overjoyed to be moving from a small guest bedroom into a dedicated area that was at least twice as big, if not three times. Sure there were and still are boxes in the garage and other items that I knew I should keep because I MIGHT use them again someday. But as time has passed, the someday has yet to arrive, so why continue to cling to things when they could be doing someone else better good. But cleaning up was not the only change I had in store for this space of mine. When I moved into my new studio, I wanted an environment that was truly me to my very core... with colors and decorations that were beautiful, slightly elegant, and somewhat romantic. I dreamed of having an accent wall draped in a lovely shade of pale pink, bright fresh worktables with a clean coat of white paint, and hiding the stacks of fabric and plastic bins sitting on ugly metal shelves behind lush natural linen curtains to give the whole room a more refined appearance. And I am ALMOST THERE...just a few finishing touches to make the transformation complete. Sorry to be so windy, but you asked. I have included just a sneak peak images, as I am planning to have a big reveal soon! Teesha Moore The magic usually happens while I am out and about....a coffeeshop, a bookstore, a picnic table in a park, a hotel room. While I have a fabulous art studio, I find that getting out of familiar surroundings can be the catalyst to really get into the groove. So I have a journal bag with all the pens I could ever want and lug it around everywhere. My studio is on the 2nd floor and I have 2 windows that look out onto the woods. 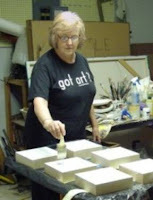 Angela Cartwright When I am hand painting really large photographs I work at my studio at the gallery. It’s pretty neat and tidy and uncomplicated. On the other hand my studio at home where I create my altered photo art can look like a disaster …but to me it is an artistic explosion…a chaotic, stacked mess of supplies begging to be used. It’s a miracle I never seem to lose anything in this mess even if I have a couple of projects going on at the same time. When a certain collection of artwork is complete, I clean everything up and put it back into it’s original place…and then I start the cycle all over again. 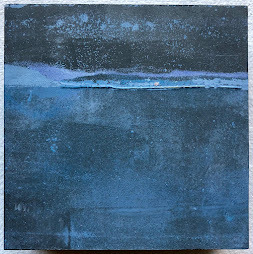 Barbara Kleinhans I work in the same place that I live, a large studio. My painting space is in the middle of the floor where I sit and work on paintings that are laying flat on a piece of cardboard. Cory Celaya My studio is not an open studio. Visitors call to let me know that they are coming. The reason being, that I like to work in a quiet space where I can zone out with no interruptions. Also, being a permanent make-up artist, I need to lock the door while I am tattooing and will not leave the client to answer phones or greet people. Doing so would be unfair to the client as well as the visitors. I have four large tables where I can spread my work. I work on more than one piece at a time. The door that you see in the photo leads to another room where I hold workshops. 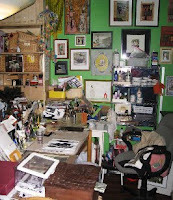 Behind the front wall is the cubicle where I tattoo permanent make-up and on the right is a mini gallery. The back of the studio houses incubation bins for finished and work in process, along with copiers, sewing machine and other equipment. 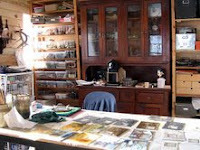 I also have an ‘In house” studio where I work on my jewelry till the wee hours of the morning. Julie Prichard We are settling into our new house where I had the opportunity to build a dedicated art space from scratch. The space is coming along slowly, but I am enjoying watching it take shape. In this house I have a workbench in the garage for “dirty” applications (spray painting, soldering, assemblage) and a cleaner studio indoors for painting. My favorite part is the table my husband and father-in-law built me from scratch. Martha Marshall My garage is my official in-home studio, though I’ve been known to work on simultaneous projects there, and on my big kitchen counter top, dinette table, and even the living room! The garage has three large tables, one of which holds all my paints and tools, and two more where I can spread out pieces that are drying. It’s very hard for me to prepare for guests, because the house is always inundated by art projects. This picture is from the garage studio. azirca My creations come together in my studio. When I say studio, really it's just my spare room that I call my studio. The room is small but functional and I seem to manage to fit all of my bits and pieces into it. I make use of the built-in wardrobe as storage and I also use our old free-standing kitchen pantry as storage space as well as sets of drawers of all sizes. I dream of one day having a studio in my garden with floor to ceiling french windows and skylights to allow the sunlight to pour in. A place where I can create and daydream to my hearts content. Until then, I am happy in my makeshift studio. Lynne Hoppe I paint the backgrounds and put stuff together at my art table in the photo. All collage material, acrylic paint, old books, etc are within reaching distance of it... I love this table and have taken countless photos of it! The other place that I work a lot is my chair in the living room. All of my watercolor paints are beside this chair. I've spent hours painting there and almost everything nearby has to do with art and painting. Leslie Marsh My work space started as a Florida room on the back of my house. It held a wicker seating area and a glass-topped wicker table and chairs. I did a lot of entertaining on that porch. 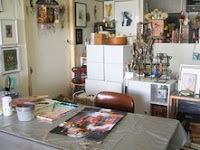 When I began looking for a place to make art, I rearranged the seating area and added a folding table against one wall. When I realized that Art was here to stay, I began looking for more permanent solutions to fit my craft and my ever-growing pile of materials. I love old things. 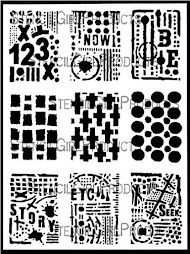 I incorporate them into my work when I can; I use them to store my materials; and I furnish my house and workspace with them. 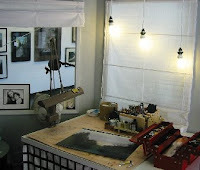 I currently work on an old drafting table as well as several other old and new tables. Various vintage cabinets, bookcases and boxes hold the things I know I'll find a use for someday. There is nothing left of the original wicker "Florida room." 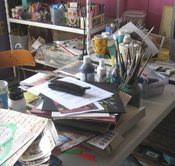 Deryn Mentock My studio space is very small...and very messy! Because I don't have a lot of space, I typically work only one project and media at a time. If I'm working on a jewelry piece, I have boxes of beads and junk everywhere. If it's collage or books, there's paper scattered all over. The size of my space keeps me more organized though. Once a project is finished, everything has to be put away....or stepped on! Ginny Carter Smallenburg Magic? Sometimes it is just hard work and sometimes it just flows. I am fortunate to have a dedicated 14'x17' upstairs art room all to myself. although my husband, a retired art teacher, sometimes joins me. He has his own art workshop in our finished basement and sometimes I join him there. 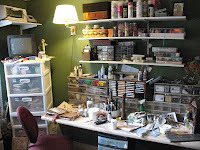 My art room has good storage, ample worktables and tons of supplies, thanks to surplus from my former store. The one thing it lacks, though, is good natural light. We moved here less than a year ago, so I am still arranging and rearranging the room to make it comfortable and efficient. 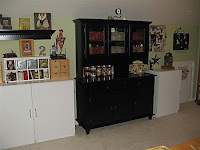 I just purchased a new storage unit and a bigger worktable, so there will be rearranging again. Elis Cooke My studio is a modified bedroom in our house. It has 2 six foot windows facing north, so even in the dead of winter, I have a lot of beautiful natural northern light. I have one longish wall where I hang work in progress while drying or for viewing while I figure out what needs to happen to it next which sometimes takes several months. Jen Worden When I decided to do more assemblage than flatter 2-dimensional work I realized I needed a larger, not-in-the-house studio. Luckily we have a number of outbuildings on our 150 acre farm, so 2 years ago I moved into my current space. I love it. We insulated and put in a propane heater that lets me work on all but the coldest days. Sided in pine, I have loads of room to store all my stuff, some on open shelving so I can see what I have, while other stuff is organized into translucent plastic shoe boxes. Included is my 6 x 3' work table, a comfy chair and enough open space to grow into. The space is very light with windows on 3 sides allowing me views of the lake, chokecherry bushes that house a multitude of birds or the deer as they wend their way down the fields. One of my favourite pieces of furniture, a handmade hutch that was from our home's original pantry, stores special items waiting to be incorporated into my work. Judy Wise The magic happens in my studio. It is messy and brimming with inspiration. 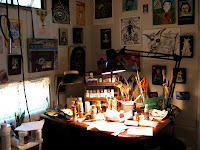 Kathy Wasilewski When my oldest son left for collage, I immediately transformed his room into my art studio. I wanted a surface where I could work that could easily be cleaned from any glue or paint spills, so I had my husband install an inexpensive kitchen countertop on one of the walls. The area is large enough that I can work comfortably on one end, yet have a friend over or even set up a sewing machine on the opposite end. I keep many of the art pieces that I have bought or traded with others in this room for inspiration. 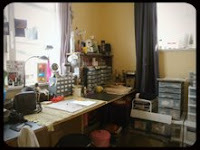 Roben-Marie Smith My work area is very small. It is in the corner of the room where we store most of our business' rubber stamps. I like it, because everything is in reach and although it is cramped, I can see beauty of nature outside my window and I am thankful to have a space in which to work! I work on an old farm table covered with glass that my mom gave me. Sue Pieper The magic can happen anywhere in the house, or even outside in the summer. 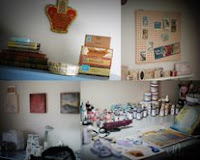 When Im playing with paint & glue, it's mostly in my studio. Jewelry has migrated to the kitchen table, that spot just feels right & for the life of me I can not make jewelry in my studio! I've got an easel crowded into a corner of my little studio, but it's the perfect spot. It's standing right by a window, there's a lace curtain behind it so I can see what's going on in the other room but not distracted by it. But the most important thing is if I sit in the living room I can see it, so I'm always either thinking about it, or working on it. Linda Woods Magic can really happen for me anywhere. At home, my workspace is a big walk-in closet with an ironing board as my work surface. I love my ironing board! I prefer to stand while I create so it is perfect because I can adjust the height as needed. Of course, the ironing board does double duty as something my friends all tease me about endlessly. It's also great for when I am traveling...every hotel has one! It's like a studio everywhere I go! Above my ironing board is a bulletin board where I pin bits of inspiration...little notes from my husband, a fun envelope, a favorite fortune, photographs, candy wrappers. Kelly Kilmer In all honesty, I like making art on the floor. I live in a small apartment. My favorite space to make art on is the living room floor. My son will be playing a couple of feet away and my husband is usually working on the computer. 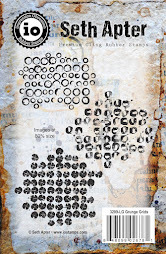 I keep my collage ephemera accessible in baskets and bags. I don't need much to work: paper, glue (usually a glue stick), some pens and my journal. All of that keeps me happy and sane! Binky Bergsman It’s a mess. An absolute mess. I wish I had someone cleaning up after me because when I get on a roll things just fly. I do the same thing when I cook. What’s important in my space is the view, not the art supplies flying. I look out onto the most beautiful lake I can imagine. OOOO..DID you have to show my mess first???? 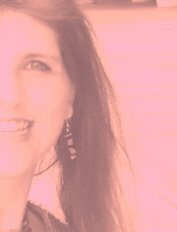 LOL.No matter...my art room is like my art..thrown together and spontaneous!..Never knowing what might happen there..
LOVEEEEEEEEEE seeing everyone's studio/art space...I long for the one's that are so pretty and neat!! is that vinyl in a fab striped pattern on the floor or painted floor boards or hwhat? juicy! There is a large amount of drool puddling on the floor here. Such wonderful spaces to work in, from the largest to the smallest. Can't wait to see the rest. love seeing all the art spaces! A friend and i were just talking today about other people's art rooms-love peeking into the creativity of others! ah this is superb!! love seeing all these creative spaces, makes me feel all inspired! I have to say, Seth, that your banners for The Pulse entries are so cool! Why would you expect anything less on the floor of Teesha's studio. WOW, wow, wow. this is AWESOME. 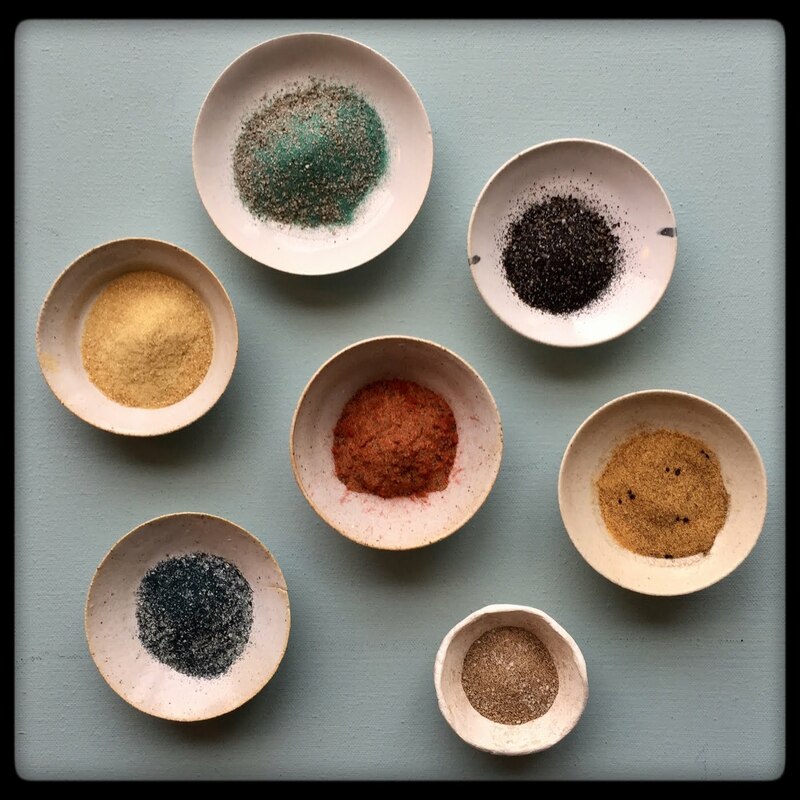 I love this peek into artist's spaces, who wouldn't? so sooooo cool! loving these pictures! My Lord... 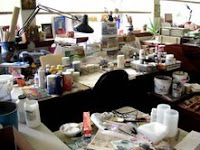 I thought I was the ONLY artist who had a workspace the same shape as mine! thank you, Seth. 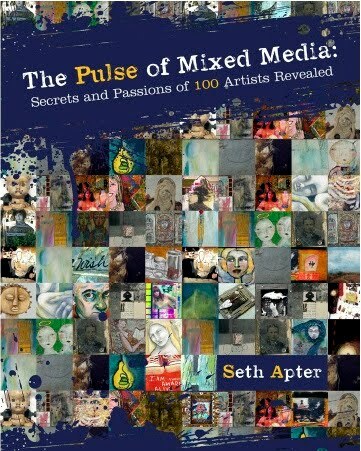 This was a great read as i get ready to move into a new home and a new studio. wow, so many ideas!